Video content is a popular form of media when it comes to e-learning. It’s a great way to engage your learner, and a nice change from static text and images. In certain cases, you may want to go that extra step and make your video interactive. 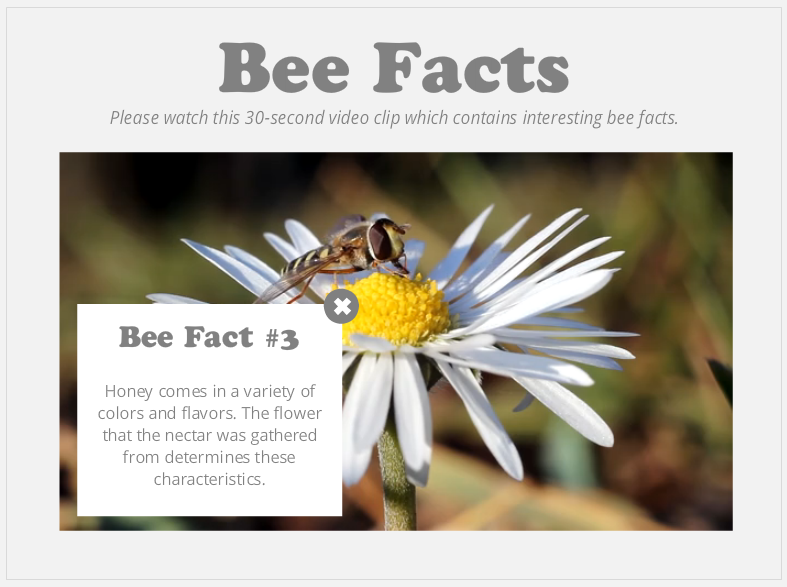 The good news is: with Articulate Storyline 2, there’s a ton of ways to create interactive video. So how did I accomplish this with Storyline 2? Read on to find out more. The first thing you need to do is add a video to your slide. Head over to the Insert tab on the Storyline ribbon, and under the Video drop-down, select “Video from File,” then locate the video file you’d like to use. 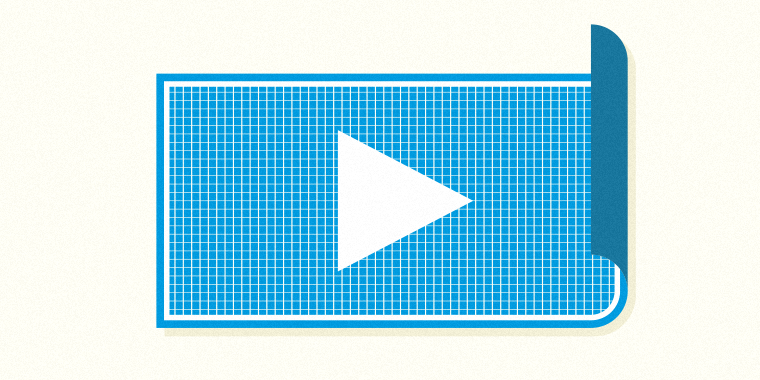 Once your video is on the slide, the next thing to do is to cover it with a hot spot. Why? By default, a learner can click on a video to play and pause it, but if they do, that will throw the timeline and the video out of sync, and the interaction you’re trying to create won’t work. So, since you don’t want to allow the learner to click on the video to pause and play it, you need to place a hot spot over the video. To add a hot spot, head over to the Insert tab of the Storyline ribbon again and under Interactive Objects select the rectangular hot spot. Place it on your slide so it covers the entire video. The hot spot will automatically create a new trigger in the trigger panel, which you can delete. The next step is to create the pop-up that will appear over the top of the video with the additional information. A quick and easy way to do this is to use a rectangle shape to create the pop-up (you can type your text directly onto the rectangle shape) and use a multiply (X) shape, placed in the top corner of the rectangle, to act as your “Close” button. Group your two shapes together, so your pop-up appears as just one object on your timeline. Now, timing is important when it comes to adding interactivity to video. Select the Pop-up Group on the timeline, and adjust its timing so it only appears for one second. As you can see in the image above, the pop-up will appear at the 1s mark. This works for my video, but you might want to have your pop-up appear at a specific time, so your additional information will work with whatever is happening on-screen at the time. To ensure my pop-up fades in and out smoothly, I also selected the Pop-up Group and, from the Animations tab, added a 0.25-second Entrance Fade-In and a 0.25-second Exit Fade-Out animation to the group. The next step is to add a cue point to your timeline. You’ll use this cue point to pause the slide and the video when the pop-up appears, so the learner has time to read the text. Now that you’ve placed all the objects on your slide and created your cue point, you need to add the triggers that will cause this interactivity to happen. You’re going to need four triggers to make this work. The first trigger will pause the timeline when the timeline reaches the cue point. Note: You must pause both the timeline and the video, or your timeline will get out of sync and the interactivity won’t work. You should have four triggers in place when you’re done. Now you can preview your project and check out how your interactive video is working. If you like what you see, you can repeat these steps further along the timeline to add more pop-ups to appear throughout your video. If you’d like to take a closer look at a sample file, head on over to the downloads and grab this free template file. Got any tips of your own for adding pop-ups to video with Storyline 2? Let me know in the comments! Want to try something you learned here, but don’t have Articulate software? Download a free 60-day trial, and come back to E-Learning Heroes regularly for more helpful advice on everything related to e-learning. Thank you for the explanation on triggers. Getting video to synch with on screen stuff while maintaining learner control has always been a personal bugaboo. I really like this solution to the issue. Good job. Delete the extra URL info starting with the second http: in the address line. Works fine after that. This clarified some issues I had previously. many thanks! This is a great interactive video example! I wanted to add that if you were to do something like this and use the built-in player with the scrub bar, clicking or dragging to an area beyond a cue point will still cause to you pause at the last cue point you missed (It seems like clicking is inclusive of the previous time points, as opposed to jumping to a single point on the timeline). You can avoid this by placing objects with no fill or stroke on the timeline for .25 seconds, and then setting the trigger to pause when the state of that object is normal, rather than using cue points. Excellent! how to create a Group? I found that you can add the same effect without so many triggers if you add the interactions as a slide layer instead: You make a slide layer to your base layer, where you locate your popup box. You change the settings on the slide layer to "Pause timeline on base layer". This way you only need two triggers. 1. One cue point that triggers "Show Layer X" when Timeline reaches cue point #1 and 2. One trigger to Hide Layer when Timeline ends. This is amazing. One question - I have paused the video as well as the timeline. I have a trigger that shows a layer with a few pop up text boxes. When I insert a trigger to go back to the layer with the video it starts the video over from the beginning as opposed to where the video (and timeline) were paused. Can anyone assist me please? Thank you John Backewich Supervisor (Quality) SFCC Contact Center Region of Waterloo 131 Goodrich Dr. Kitchener, N2C 2E8 519-575-4400 ext. 3196 (Office) 519-501-8309 (Cell) [cid:image001.png@01D27300.74AC2A40] [Description: Description: serve] The Region of Waterloo provides more than 60 per cent of municipal services to a growing population of 550,000 people. We are committed to creating an inclusive, thriving and sustainable community through innovative leadership and a range of services such as: public health, social services, planning, heritage, water supply, regional roads, waste management, ambulance service, rural libraries, public transit, community housing, emergency planning, Provincial Offences Courts and airport services. Yes, you have to go to setting for the base layer (down in the rigth corner with your base layer, there is a setting icon, a small wheel or if you are in Story View, you can see the setting in the panel to the rigth, when you have the slide marked. In settings, called Slide properties, you have to change "When revisited" to Resume saved state. That should solve your issue. Sometimes Storyline does it automatically for you (since the setting if for automtic choosing of the program, where the definition say it will choose correct itself - but I don't find it accurate enough). Thank you so much for the feedback. I did change the settings to "resume saved state". When I click on the pop up it does go back to the video on the other layer but plays it from the beginning, not from the paused state. I am not sure why it doesn't work - but I sometimes also experience local errors with code that doesn't work on some part of my program even if the code looks identical to other parts that does work... I am working on a massive e-learning with +50 videos rigth now and I am already seeing strange problems like this... However I have a feeling that it you start with a completely new slide (without copied code) and do things manually, it usually works all the sudden. Another thing to try, is instead to have the user click an X for closing the slide layer, you can also choose to Hide layer when Timeline finish - and then make your dialog long enough for the user to read it, before it close your slidelayer down and continue from the baselayer. Hi Anne! Thanks for leaving your feedback! I did attempt to put the pop-ups on slide layers originally, but then I realized that I cant have a trigger on the layer that will resume the timeline of the base layer and resume the video on the base layer. Were you able to figure out a way to get that working for you? Yes, you have to go to setting for the base layer and change "When revisited" to Resume saved state. That should solve your issue. Sometimes Storyline does it automatically for you (since the setting is for automtic choosing of the program, where the definition say it will choose correct itself - but I don't find it accurate enough). This is great, I mostly create software training, and videos are a large part of what I do. This is a great way to add more information and interactivity to some of the less interactive demo videos I do. I also got an error message when I tried to see the demo. GREat INFO, THO. Just what I was looking for. Thanks. Thanks for sharing. Can I ask if there is any way of having pop out questions appear at certain points when the video is paused? Yes - you can always use radio buttons and build some questions/quizzes into your pop-up; the only thing is in the context they questions won't be graded for an LMS. Thank you Nicole! Do you know if there is a way to implement interactive buttons/messages on the e-learning for mobile using AS 360? When I play the e-learning on my iPhone 6 the video pop ups. Because of the pop up I can't show any animation or message above (layerwise) the video. Hello, I"m having difficulty adding a youtube video into my slide. I've tried inserting it as a web object as well as coping the embed code. Upon careful examination of the code I realized that when I press the insert button Articulate Storyline automatically adds " ="" Can someone please help me? It works very well. Thanks everyone for sharing.